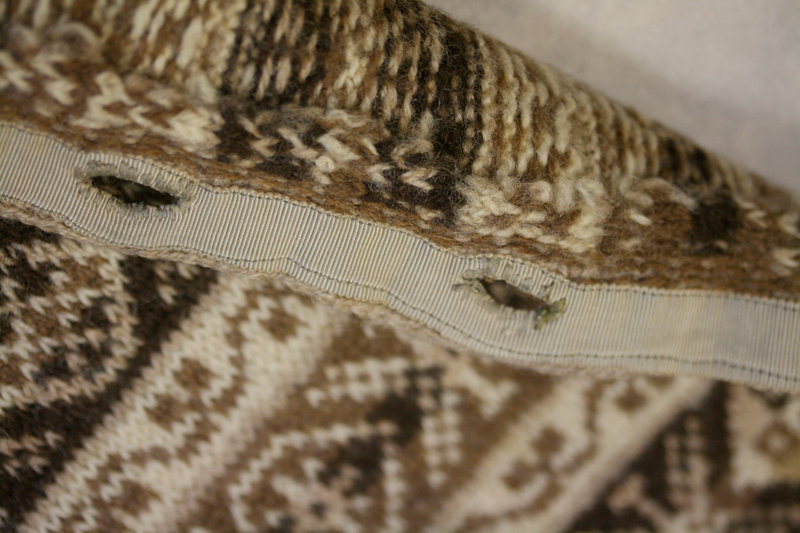 Here, in this garment in the collection of the Shetland Museum and Archives, the steek edges have been trimmed back and blanket-stitched in quite an attractive way. I recall, when I handled the following garment, that I was very impressed with the method that had been used to finish its buttonband steeks . . . 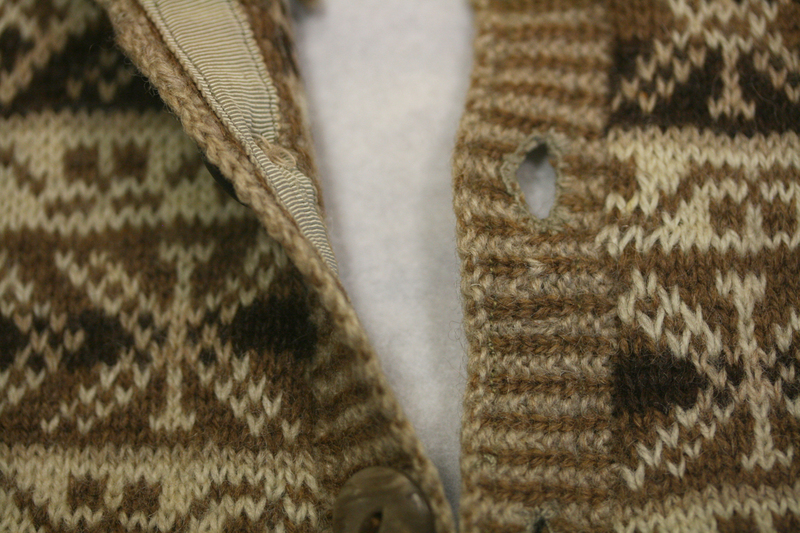 It is a 1930s Fairisle cardigan in the collections of the Shetland Museum and Archives. 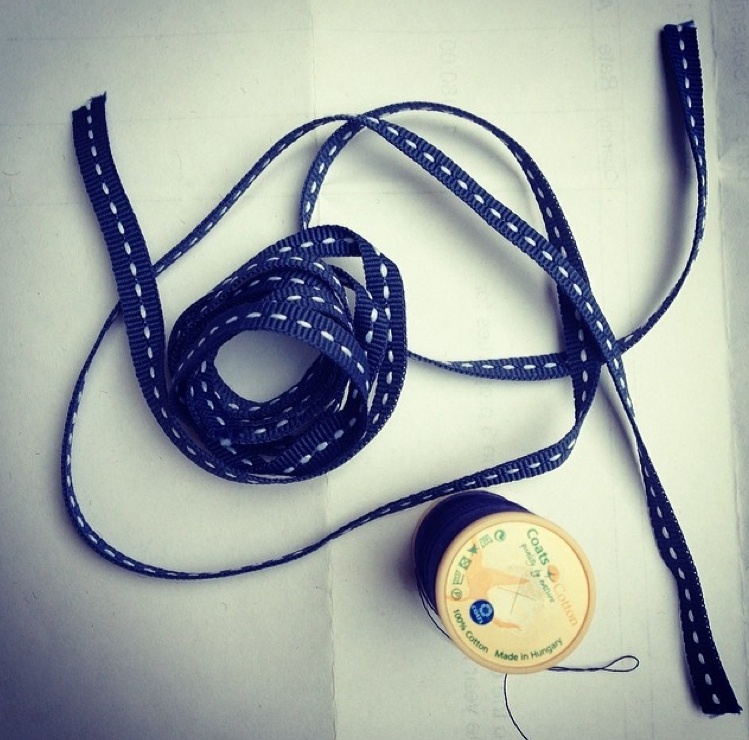 The grosgrain ribbon has been machine stitched to the buttonband, then buttonholes have been cut through both band and ribbon, and reinforced with hand-stitching. . .
On the inside, the steek edges have not been trimmed, or even stitched down, but have simply been allowed to wear and felt-in to the inside of the garment. The result is very neat, and very strong – even 80 years later! Thanks for this tutorials, I knitted my first cardigan with steeks and I like it very much!! Having put a great deal of work into knitting the beautiful Epistrophe pattern (in Drops Karisma, a slightly fuzzy 100% wool yarn), I am now (of course) feeling predictably scared of cutting it up the middle! I keep wondering whether serging/overlocking the cut edge is an option? Not traditional, I admit, but certainly secure. I shall try it on a swatch, but curious and grateful to hear views/experience on this. I think this cabled button band would look simply divine on your fabulous sweaters. 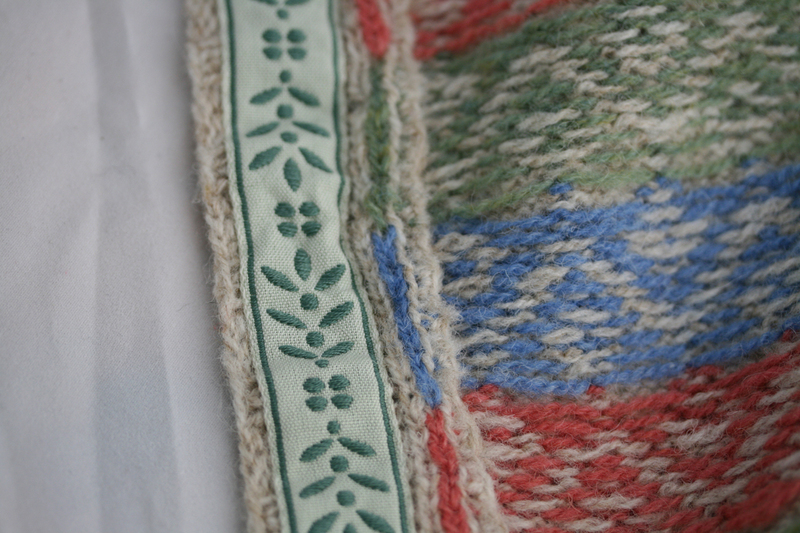 Regarding button bands/holes I recommend Eunny Jang’s Tulip Buttonholes video via Interweave or video tube. They are great buttonholes, look really neat! Thanks for the steeks tutorials, I’m working my way ( about 3/4 so far) through your Sheep Carousel, it really is a fun way to learn steeks, vikkel braids, stranded colour, icords, corrugated ribbing the lot!! Thank you so much, steeks are fun, I’m really enjoying it! My advice to anyone scared stiff of attempting steeks – as I was – just get on and do it, it really isn’t the problem you think it will be. I’m now looking forward to doing grown – up steeks on a cardigan or sweater next. Did you do a line of running stitch down the center of your ribbon? I like how it looks. I need to put more grosgrain ribbon on the list of supplies for the sewing studio along with some zippers. I just did my first grosgrain lined buttonhole band. 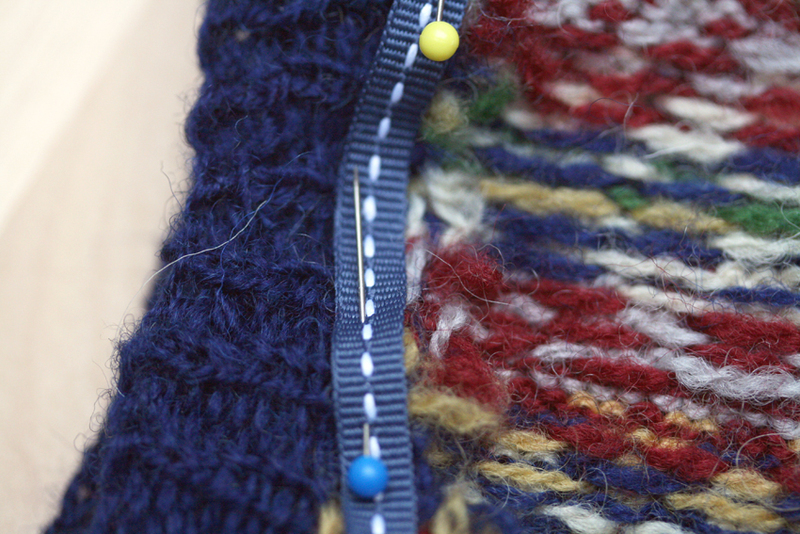 I knit the buttonholes into the garment band per the pattern, then pinned and marked the ribbon carefully, machine stitching those buttonholes before tacking it to the band, then tacked down the other side before marking and sewing down the buttons. It worked great. I’ve been looking for a discussion of steeking like this. Thank you for showing the many ways of finishing a steeked edge. I adore steeking and wish more designers made use of the method in their cardigan designs. To anyone who is afraid to cut their knitting I say triple check your pattern instructions, double check your steek stitches, then boldly cut! You’ll be glad you did! Thank you so much! I’m nearly finished with my first steeking project, and I already have anxiety about a few of the stitches threatening to unravel. I reinforced the steeks on the arm holes (it’s a sweater vest) with crocheted stitches, but I neglected to do the same with the neckline. I’m going to redo the neckline ribbing anyway because I was messy in picking up stitches, but I’m definitely going to use a ribbon to stabilize the steeks! Wow, just in time. I am steeking (with the crochet method for the first time, fingers crossed!) 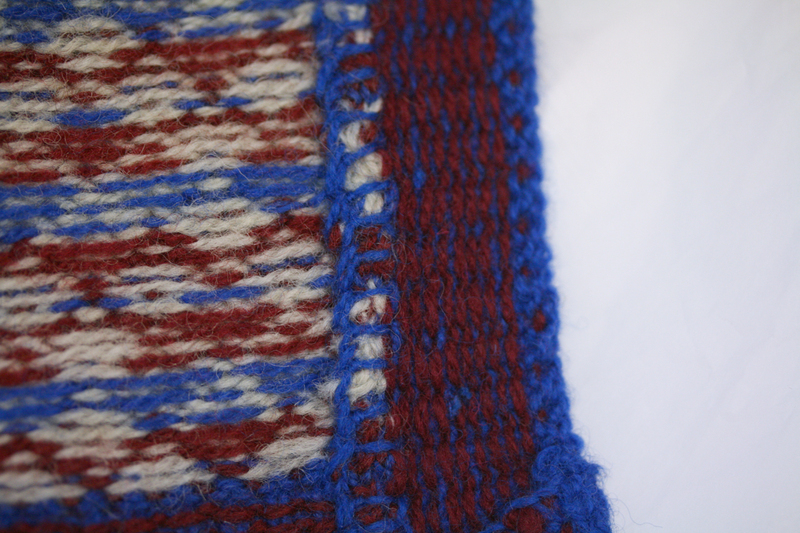 a sweater as we speak, and looking for a neat way to finish off the inside. Love the ribbon idea! It still gives me the heebie-jeebies to see scissors in the vicinity of knitting, but one of my resolutions for this year is to steek something. When the time comes, I’ll be referring to your many well-written posts on the subject. Thanks for that. I had often wondered what you do to a steek besides just stitching it down or using your icord method. I have a similar obsession with ribbon on button band linings. They do give such a nice finish. If I ever get around to doing a steek, I shall keep this method in mind! I have never heard of a steek before. I don’t quite understand what part of the garment it is now. Is it a button band? 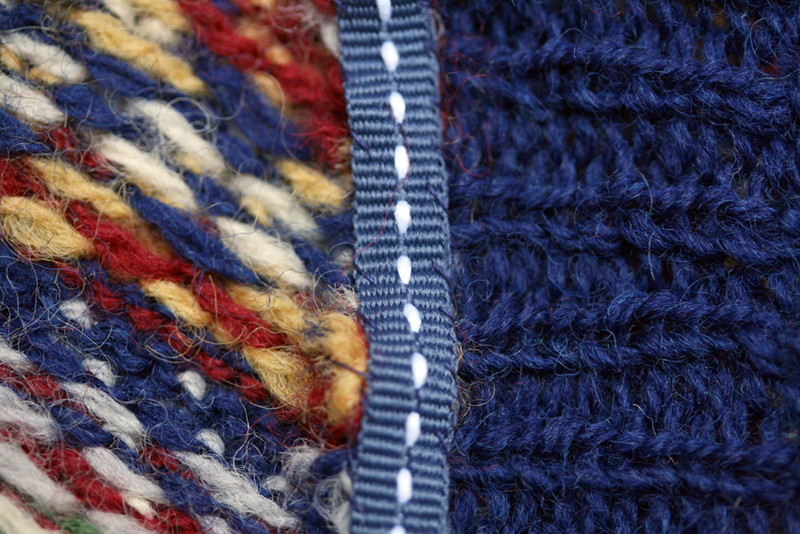 Its a small bridge of stitches that enables you to knit a garment like a cardigan or jumper completely in the round. When you are finished, you cut the steeks open, and add edgings / sleeves / or buttonband. I am teaching a class in steeling at a branch of the NSW Knitters Guild tomorrow, so thanks for your timely summary to point people to for more information. I find when I do these classes that people often want to learn ‘the right way’ to do things, and it’s so refreshing to be able to point to an someone who can confidently talk about different solutions in different situations. The ribbon method of covering steeks is my favorite, because it’s like a little surprise pop of color or pattern. I love buying fun ribbons to add to my collection, and adding that little something extra to the inside! Check out Anna Zilboorg’s perfect button holes. They’re self-faced and tubular and pure genius. The method is in her Knitting for Anarchists; I used it in a jumper for little girls (http://www.ravelry.com/patterns/library/winter-garden-jumper) and think it’s unbeatable for good looks. Echoing the recommendation of Alisdair Post-Quinn. I have a technique for a buttonhole in a double band. If you send an email address I can provide photos for your assessment. Or a link to my Ravelry page. Love your projects. And stories. Lucy Neatby actually has a pattern for double stocking stitched bands. http://lucyneatby.com/index.php?specific=1000289. I love the idea. This is very interesting…I love the idea of cutting through the ribbon and reinforcing the button hole. 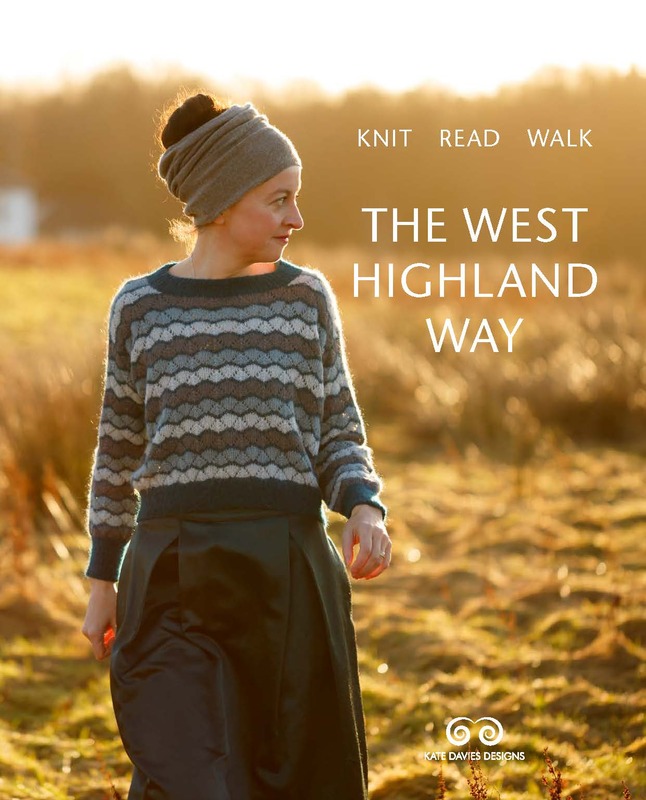 I too would suggest checking out Lucy Neatby…..she is a master at double knitting…and loves exploring technique…like you. Excellent tutorial and totally inspiring. I recently used your double line of crochet steek on a unloved sweater for a friend. It almost instantly became a rather elegant and very usable jacket, very gratifying. I also purchased a sale jumper in the supermarket realising it would make a fantastic cardigan. 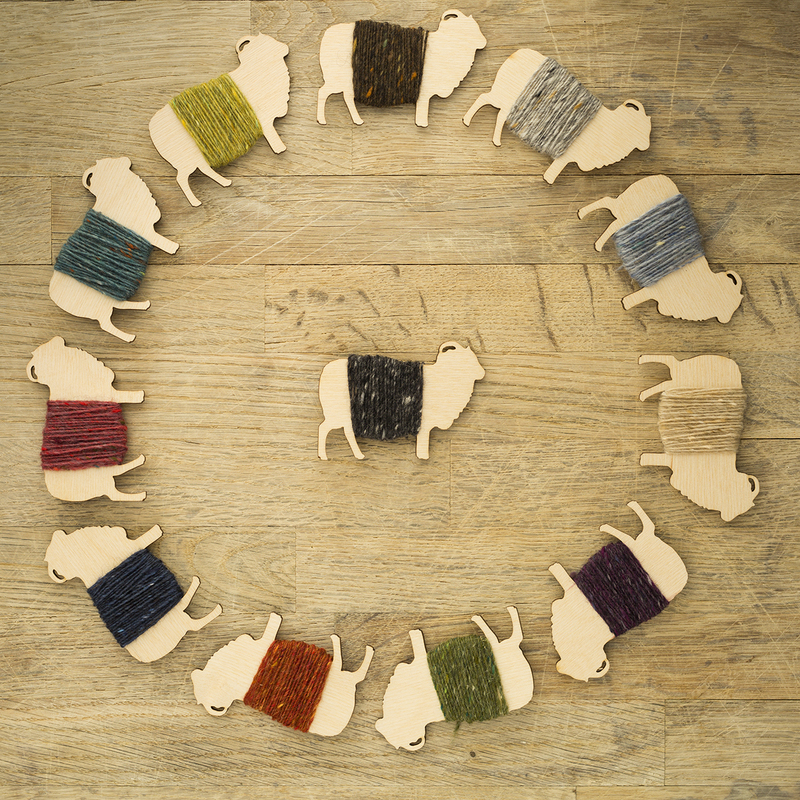 Great fun, like woolly engineering! Speedy recovery to Bruce, it’s the scrape of the ” lampshade” on the radiators I always find so riveting. Thanks for the post. I too love your blog, your designs, learning and be inspired about knitting, fiber, textiles, history, etc… Hugs for Bruce-hope his recovery is going swiftly. There’s nothing that scares me more that steeking! Yikes! Thanks for the confidence boost! Try Alasdair Post-Quinn out of Boston, MA in USA. He is the very talented author of Extreme Double Knitting and enjoys a good challenge. I really enjoy following your work and textile history articles and celebrate with you, your personal recovery challenges. Just like a sunflower…Always follow the sun! concerning the buttonhole matter, I recently watched Lucy Neatby’s DVD “Finesse your knitting 2”, which covers this Topic in depth. Lucy is an amazing teacher. I also watched her craftsy film “foundations in double knitting”, which is also great. 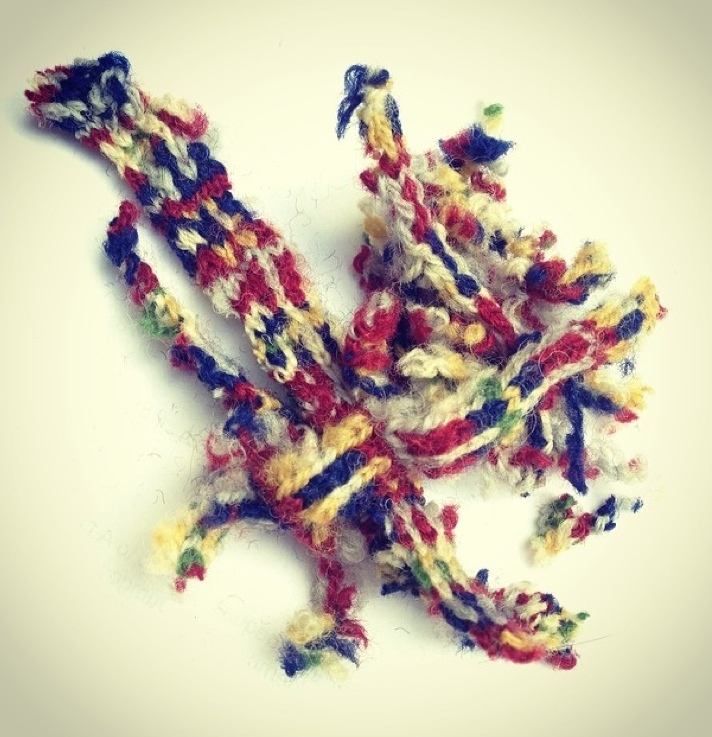 (By the way, Amy Detjen’s craftsy film about stranded knitting is also great). I wanted to tell you for a long time already, how much I admire you,as a Person, knitter and designer. You are a real Inspiration for me. 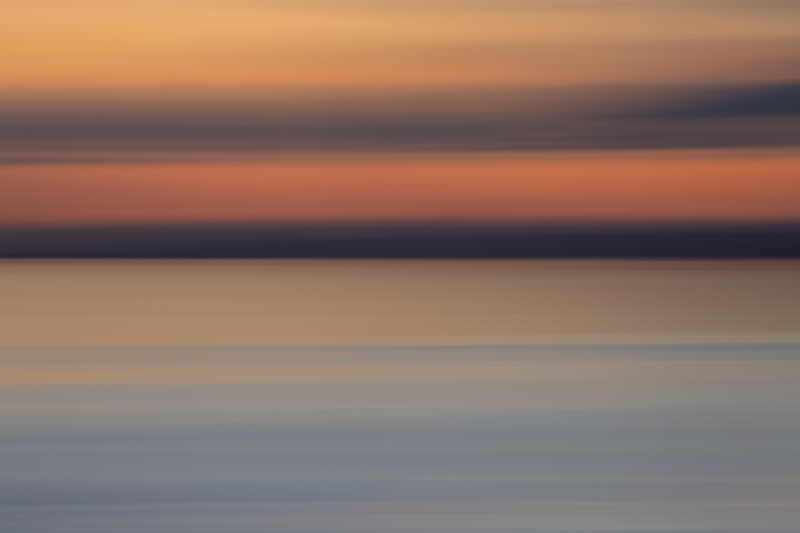 I like your designs very much and find your blog very interesting. I’m also a passionate knitter and am also very interested in textile history and costumes. 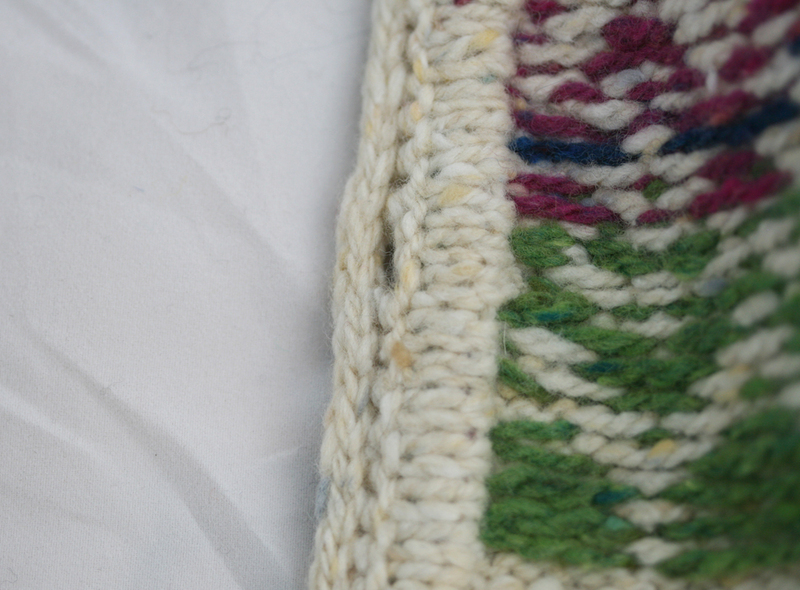 I’ve recently started work on a Fair Isle gilet (http://knitoxford.wordpress.com/2014/02/18/upcycling-and-fair-isle/) and am planning to rely on your steek sandwich instructions to see me through chopping it up the front when I get to that point! Any tips you’d like to share about steeking for armholes?? This is just a suggestion-M’Lou Baber’s Double Knitting? The subtitle is “Reversible Two-Color Designs” and there are cardigans in there. Just cut my first steek recently-magic! This is such a helpful post-thanks! When reading your question, I thought about tulip button holes. I find these fascinating, though I never tried them !